TRAVERSE CITY, Michigan — It’s been a couple of weeks since our Circle of Blue team completed its 27-day research trip to India. Our work, a scoping mission to prepare for a comprehensive project in 2013, focused on understanding the contest between energy, food, and water in a nation soon to be the world’s most populous. India also is contending with deeper droughts during a period when it has emerged as one of the planet’s top consumers of water-thirsty energy and grain. 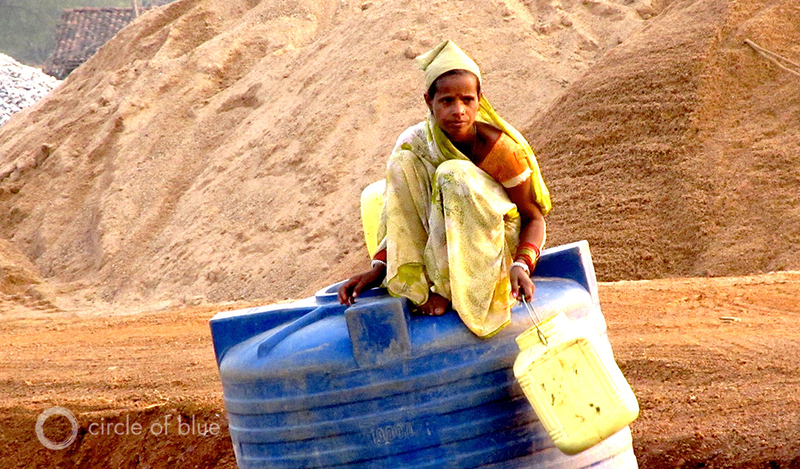 A water transport construction worker rests atop a bulk water container near Tilda, northwest of Raipur in Chhattisgarh, India. A 1,350-megawatt coal-fired power plant under construction in Tilda, near Raipur in Chhattisgarh, is one of more than 100 big generating stations recently built or nearing completion across India. 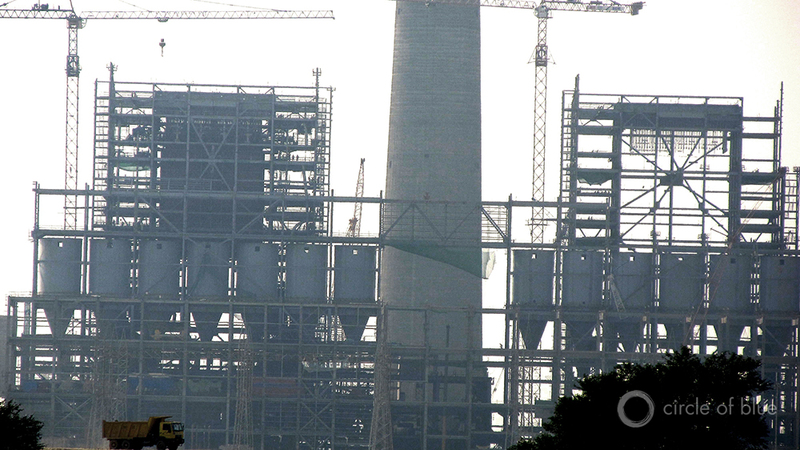 Only China has a bigger coal-fired power plant construction program. 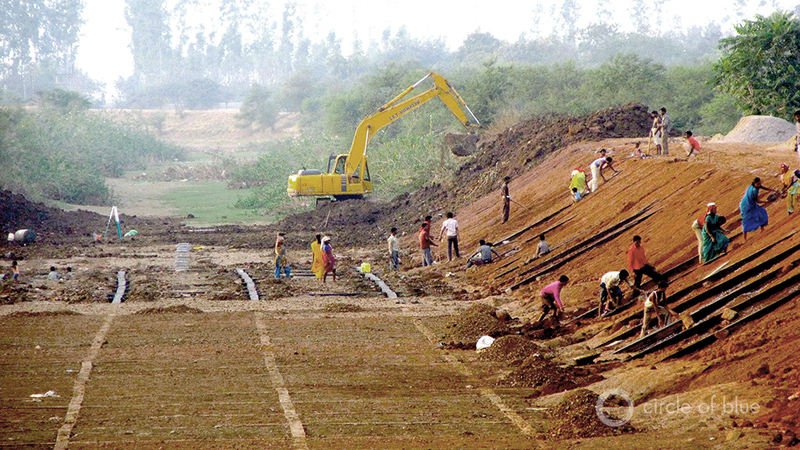 Workers swarm a big water transport canal near Tilda, India undergoing repair and expansion to serve the steam production and cooling requirements of the region’s expanding number of big coal-fired power plants. Thank you for the piece. I am a researcher and former journalist in India working with a policy think tank based in Bangalore. The need for water especially in the energy sector is being grossly underestimated in the India. In India, policy makers are well aware of fuel resource constraints and the pressures from the International energy/fuel markets – by that I mean that despite domestic reserves, coal fired plants in the future will have to rely on imported coal rather than the low calorific value domestic coal. While there are considerations for more energy efficient and fuel source efficient systems (ramping up advanced coal technology deployment in the next 20 years) there has been no talk of the energy-water connection. Water is completely different ball game which no one wants to talk about. Lack of data combined by the fact that water is a state subject while energy planning is a concurrent subject (under state and federal jurisdiction) make the policy discussion skewed. Even the strong momentum on Renewables (Solar National Solar Mission) trying to capitalize on solar sources seems to not look at the water requirement of technologies along with solar irradiance. This is odd, given that solar technologies require considerable water for upkeep and maintenance which may not be available with ease in semi-arid areas that are considered best for deployment. The state’s eminent domain principle applying across the energy-water-food nexus makes this issue contentious and difficult to talk about given established ‘policy priority’. Please keep me posted on future work in India. Thank You.